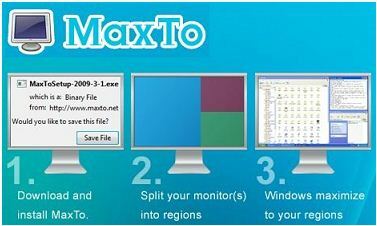 MaxTo is a program that lets you maximize windows to different parts of your monitor. Ideal for programmers, graphic designers and anyone else who needs to have many windows visible at once. Use all the space on your widescreen. Split your big monitor into smaller ones. Use all of your monitors. MaxTo is a really small program, that can give you large productivity gains every day. At less than 600kB – MaxTo uses almost no system resources. It supports all the current versions of Windows – XP, Vista and 7 (both RC1 and Beta). It even works fully on 64-bit versions of Windows. You can pick how you want your windows arranged using a very easy procedure. You can move your windows around using the keyboard, or simply maximize the windows where you want them. We have an extensive FAQ. Read it, or ask us via e-mail (e-mail address is at the bottom of every page). We promise quick replies.